What is your favorite part of working at Thos. Moser? A little bit of everything really, I enjoy having variety in my work. 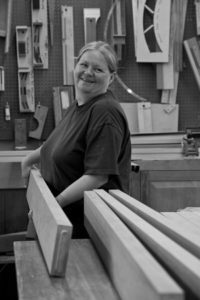 Around our Auburn workshop, if you have a question about beds, Lisa is the person to go to. With more than 25 years of experience at Thos. Moser, Lisa has a wealth of knowledge when it comes to making pieces in most any category from chairs to cases. Prior to joining the company, she struggled to find a job that could hold her interest. She started in our sanding department and then moved on to finishing and chairs. Today, she ambitiously completes the task of crafting beds of all sizes and styles. Her favorite is the Pencil Post Bed. “It’s been 27 years and it is still interesting to me,” she states. The most rewarding part of her job is watching the final piece come to fruition, starting as a pile of wood and ending as a beautiful bed. Those who know Lisa know she is a dog fanatic; she participates in competitive sports with her dogs such as sheepdog trials, agility and running obstacle courses. Others may also be surprised to know that she formerly traveled around the world photographing whales. She has been on expeditions everywhere from Canada to the Dominican Republic and Mexico.